After the 1987 SKC season ended our imaginative kitefliers took all their hardware, pairs of kites, costumes and other “accessories” to the new event called “Innovative”. The first year for Innovative competitions (1988) were based on a set of rules decided on over the winter by the AKA SK committee. Things were pretty “loose” as no one was really sure what was going to happen! The AKA rules book defined the basic judging criteria for Innovative, as follows “For Innovative you will receive three scores from each judge, Technical Merit, Artistic Merit, and Innovation………..” Not very specific?? Unlike today’s Freestyle, the audience was not involved in the judging process. “Concepts” the competitors were urged to include in their routines as well as things judges were expected to watch for were, Originality, unusualness, entertainment, accessories, and physical action. The fliers were given no restriction on what they could do in the 3-6 minute time frame, other then issues concerning safety and “Good taste”. The judges didn’t have a clue in the beginning. Dan Buxton, of Cleveland said something I’ll always remember and changed many Innovative Judges from philosophers to “Scorers”. Dan said after hearing the “Apples to Oranges” thing one to many times, “Look Apples are sort of round, so are oranges. Apples have skins, so do Oranges. Apples have seeds, so do Oranges. Apples grow on trees, so do Oranges. So lets quite thinking about all the differences, focus on the similarities, and start writing down some scores”. The best way I know to tell you about what became “The Greatest Show Above Earth” is to list Innovative Performers from across the country and a short description of their routines. Ron Reich (San Diego, CA) – I talked about Ron’s two kite routine in a previous post. As the “competition” became “Hotter” Ron included a third kite in his routine. 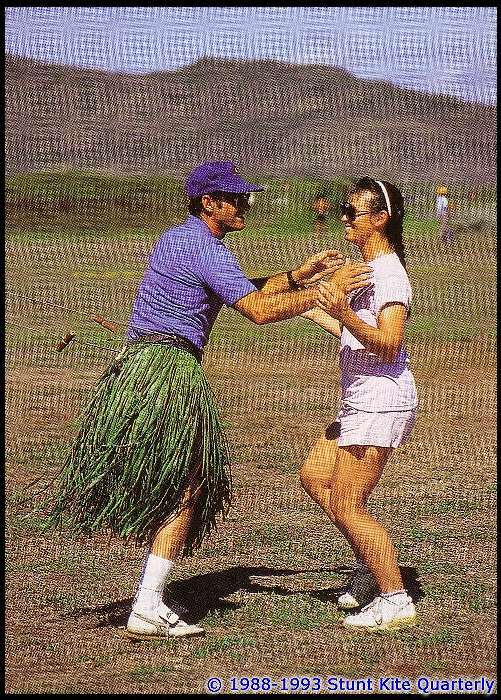 Even that wasn’t “Innovative” enough for Ron and he eventually fielded a routine that had a “Hawaiian” theme (Not the kite, but a grass skirt) Ron flew a single kite with the lines attached to his belt. BUT he didn’t look at the kite, but rather faced backwards and looked into a pair of Chrome Sunglasses that team mate Pam Kirk was wearing. He flew the kite, standing backwards, from his hips, while watching it in a reflection! Lee Sedgwick (Erie, PA) – Lee became well known for his “dog stake” flying which he actually called “Solo Flying” but for many of his Innovative routines Solo flying was only one part! He included a technique he called “Long Line Flying” which entailed a single line 100 feet long with each end connected to a six foot Flexifoil. Lee would fly the ‘foil from the center of the “Looped” line, at some point in his routine he would attach this “Long Line” to two widely spaced dog screws and release the kite which would continue to fly on it’s own while he went off to do something else. I give Lee much of the credit for the popularity of Innovative Competitions, because he very seldom repeated a routine, and EVERY routine contained something new, and “Innovative” Lee’s best quote is, “If you do it twice, it’s not Innovative!” Just for the record Lee Sedgwick flew a stack (six) of his custom made Spectrum Darts (wings) Quad Line (four line) in 1987, about a year before The Revolution was preimered! Now that’s INNOVATION!! 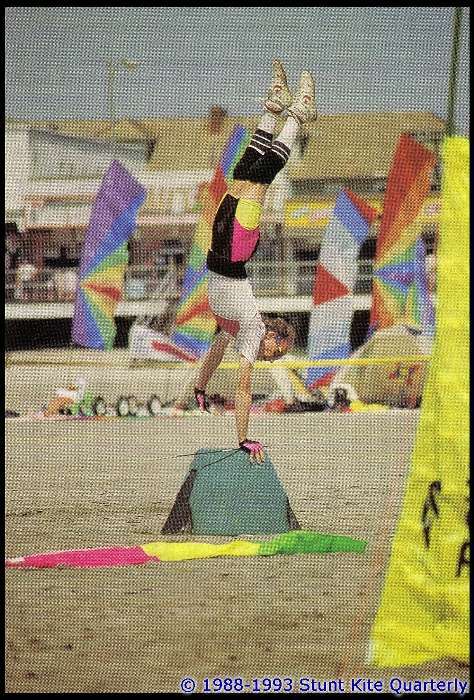 Phil Costello (St, Augustine, FL) – Phil had a technique which he called “Stunt Dancing” He would launch a single kite, then an assistant would blindfold him! He would continue his flying while performing “Tae Chi” type movements synchronous with the kites flight. Phil wasn’t very good at his “Blind Flying” but he was one of the foremost “Promoters” of this new competition. Billy Jones (FL) – Billy put together a routine that was based on Western music with narration that talked about Billy, the Kid (his nickname, by the way) He moved from kite to kite and performed different “Cowboy” antics. The “Highlight” of Billy’s routine came when at a certain point the narrator said, “… and he poped a brew and drank it down…” at the same time Billy opens a Can of real beer and takes a swig! Not terribly “kite related” but the crowd loved it! Malcolm Moore (Hawaii) – Mal was “hot on the heels” of Lee for quite while. Mal flew several routines, but the one I remember the most had to do with the Cold War and the Space race between the USA and the Russians. Some of his kites were red with the USSR insignia, others USA flags. He even wore a space suit! Joe Perron (NJ?) – Most of “Photo Joe” Peron’s Innovative routines were based on Ron Reich’s two kites/one flier idea. Joe did that pretty well. But Poor Joe always seemed to have some “disaster” befall him during his routines. During one Innovative, Joe hooks one kite to his belt and he launches the other holding the handles in his hands. About 1/2 way through Joe’s routine his belt begins to slip, eventually pulling completely apart. Through all this Joe is frantically trying to keep his pants from falling. The “LOUDEST” applause of the day came when everyone saw his red polka dot boxers. Poor Joe! BUT great flier, always came back to try again! Pete Dolphin (NJ) – Pete performed many times in the Innovative arena. One highlight was Pete dressed in a Tuxedo and Top hat, with beginning music, something about “… puttin’ on my top hat, dustin’ off my tails…” and in mid routine the music switches to ZZ Top, Pete pulls apart the Tux to revel an “Out Law” outfit underneath. Another routine of Pete’s became something of a “foreshadowing” of the problems with this competition. 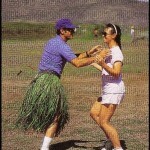 Official rules said that only the contestant and what they do on the field counts. No “assistant actors” were allowed. So the judges decided to ignore “Dorothy” and thus ignore the music. Pete came in last, and the judges almost got lynched! These few that I’ve talked about are, by no means the only Innovative Fliers in the country. There were hundreds of fliers exercising their “talents” out on the field, and I can’t possibly mention all of them! The event saw the entire spectrum from the SPECTACULAR routines like Ron Reich’s to the RIDICULOUS like the guy that flew a tiny dual line kite for 5 minutes, WITH HIS TEETH, to the tune of “Tip Toe through the Tulips”?? Innovative, was a competition that was supposed encourage Imaginative ideas in kiteflying, somehow it got bogged down in the need to “Write numbers and score” The early Innovative Competitions saw 15 fliers or more at every event. The event was the “Highlight” of most events! Something happened since those “Hay days” in the beginning. Just imagine for a minute, that you show up at a kite competition someplace in the US Your an Experienced class competitor and are anxious to participate in a “Real Ballet Competition” You stroll over to the events “Flight Order Bulletin Board’ and see that you are in a Flight Order that contains 25-30 other Experienced Class fliers all entered in the same ballet event! Pretty amazing? Pretty unreal? Well, out on today’s fields those sort of numbers can only be dreamed about. BUT back in 1990 these numbers of contestants did, in fact, register and compete at many events across the country. This was the case for all the classes, not just Experienced Class.There were close to 60 SKC events held every year all across the country and at each event the organizers had a “monumental” task of getting all the many fliers and events completed in a weekend. 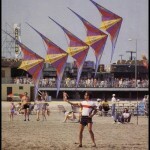 From the very first AKA national Sport Kite Competition in 1982 competitive Stunt (sorry not a sport yet)! Kite flying grew like a weed! Everyone was doing it, everyone wanted to host an event! This “stunt kite thing” was HOT, big time! In order to compete at the first AKA SK comps in Detroit, all you had to do was walk up to the guy running the event and say, “I’d like to try this!” Anyway, there was a grand total of six interested fliers, so it really didn’t matter! 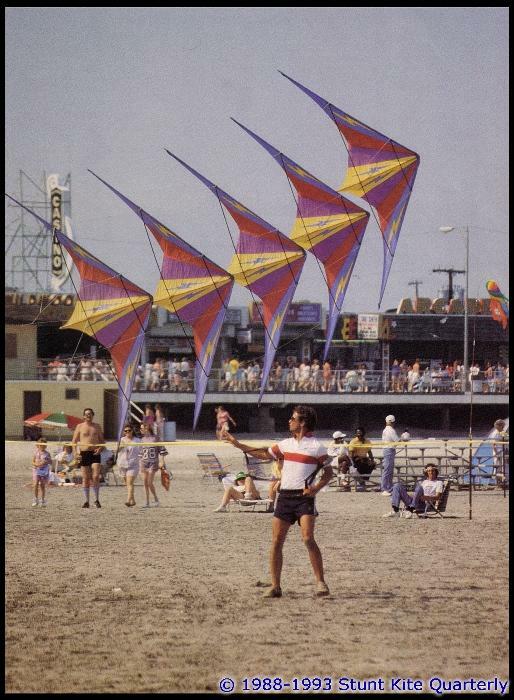 The 1986 AKA convention was the first to host a “serious” and organized stunt kite competition. That event only held Experienced and Open class categories (Philosophy at the time was that “beginners” didn’t belong in the “World Series) The procedure the AKA used to “qualify” for the Nationals was simply to register for the Convention. No prior qualifications! Nothing else was required! The solution the coordinators came up with was to divide the 28 fliers into two “Heats” of 14 fliers each. Each “Heat” would have it’s own flight order, judging staff, and time slot! Each “Heat” would fly normally, ending up with a 1st, 2nd, and 3rd. Later on in the event a “Finals” would be flown. This “Final” would have six contestants (1,2,and 3 from heat #1 and Heat #2). The fliers LOVED this “Heat” method. The most obvious, was that even if you came in 3rd in your heat, you got another chance in the finals! This “heat” idea did put a scheduling strain on coordinators, as they “ultimately” had to find time and staff to hold 3 events (EIB Heat #1, EIB Heat #2, EIB Finals) But it was better then “Killing” your judges! League Style Precision was invented about the time (League – named after the Eastern League that flew it first) In League Precision, you entered the field and when you called “IN” you started to fly. You had to “insert” a compulsory from the ones assigned to your class into a series of “Transition” moves between the compulsories. To help the judges “See” your compulsories you called “In” and “Out” when you got to them. There was no stops between compulsories, and in essence your entire routine was a Freestyle, with compulsories added. just another “method” to deal with “Too many fliers”. Then we came around to the AKA Nationals every October. The system that was first used by the AKA of “Just Register” wasn’t working. The Stunt Kite Competitions took 3 days and most all of the available fields. All the other “Interest” kitefliers were really “Up in Arms” No one else was getting any field time but the Stunt Kite People. Fighters, Rok, Comprehensives and all the other kinds of fliers, were “kinda” P.O.ed If you’ve ever heard fliers use the stunt flier nickname “Sky Hogs” It came from this era, and it wasn’t meant as a compliment! So, the AKA Festival Committee (Sorry we didn’t have a committee our own yet!) decided to try and limit the number of stunt kite fliers at the Nationals. The first method was to “require attendance” at any “sanctioned” stunt kite comp someplace in the country. (Remember at this time ‘sanctioned” meant strictly “Insured”) This idea didn’t reduce the Convention “Sky Hog” contestants by much, but it did tend to increase attendance at the “sanctioned” events, which were already “swamped”. OK, so despite the “Trophy” requirement, the comps at the Nationals were still huge, as there could be 10 “sanctioned” events. 10 EIB events and 30 fliers that trophied, thus earning the right to fly at the Nationals! This was also about the time that the AKA expanded the Classes for Stunt Kite Comps from 3 (Nov, Exp, Masters) to include Intermediate. There were just “Too Many Fliers” for only 3 classes! In 1992 Dave Gomberg (AKA prez at the time) had heard me “Gripe” both in public and private about the flack that stunt kite fliers had to take from other types of kitefliers, simply because they wanted “to compete” at the Nationals. I also went on at length and quite vocally, about the my belief that in order to be allowed to compete at the Biggest stunt kite event in the US (The Nationals) you should “Earn the Right” to fly! I got pretty boisterous about it sometimes. One of my favorite “whines” was, “If a major league baseball team wins one game at the beginning of the season, just because they took First place Once, doesn’t give them the right to play in the World Series!” they have to “Earn the Right” to play by having more wins then any other team! At about this same time another flier (and a great one, by the way), Bob (Billy Bob) Hanson from the East Coast was also “Hot and Heavy” on the same issues, and we had corresponded and talked a lot about the problems! Oh I forget to tell you all, I wasn’t an impartial observer through all this Tirade, and Whining I was doing, I was the AKA’s Festivals and Competitions Committee Chairman! So, quoting that old saying, “…if you aren’t part of the solution, your part of the problem…” Billy Bob, Dave and I spent about 4-5 months of emails, letters and phone calls discussing a solution to the problem. The goal of our discussions were 1.) To LIMIT the number of contestants that could fly at the AKA Nationals. 2.) To REDUCE travel time and expense while trying to qualify for the Nat’s 3.) To EARN the right to compete at the nationals. Finally in March of 1993 after a voted approval by the AKA Executive committee, the AKA’s Sport Kite Conference ranking System was announced to the fliers and the AKA membership (Hey we just became a Sport! I wonder how that happened?) Most of those original details and the announcement were carried “Front Page and Above the fold” in Vol.15 No.2 March 1993 KITING. BUT the contribution I most proud of? We already had AKA regions! AKA sections? Sport Kite Divisions? One problem that the system didn’t really fix was “Travel” time and expense. For example Central Conference included four of the largest AKA regions (6,7,8 & 9 at the time) but also had the least fliers, in the most area, coupled with less events then the other two conferences. Travel was still a pain! BUT the AKA Nationals at Wildwood NJ in 1994 did have a more manageable group of fliers for the official comps. The other types of fliers were also appeased, but most of that was the fact that Wildwoods beach is so HUGE everyone could fly at the same time! With the travel problem, The Conferences later were expanded to the six (around 95′ – ’96??) we have now with the hopes of making the system more Fair! At the time I was no longer “Official AKA” anything, and I began to notice a significant “phrase” beginning to appear in Conference reports, and conversations with event coordinators, competitors, and AKA officials. I know that “lack of sport kite competitors” and what to do about it, is a frequent topic on flying fields across the USA. Believe me I wish I could give the answer. If I did have the answer to that question, I’d be the President of the AKA and Dave would be retired in the Bahamas. I’m not sure why this is happening either? I do hope that as some of you that don’t know a lot of this “History” might see something here that will help to answer that question, today! How to compete in a stunt kite event and make money in the process! In the Midwest USA we had an event called the USAF Museum Kite festival held in Dayton Ohio USA. Although, basically a fun fly, but we did attract most of the big name dual line competitors from the area. Fliers such as Lee Sedgwick, Dan Buxton, Eric Wolff, Pam Kirk, Vern Balodis and about 100 other not so well known fliers would make it to the event! We held the event on Labor Day weekend, and for us the three day weekend was an “added perk” we used to attract fliers! In preparation for the event I called fellow stunt fliers and asked if they were gonna to attend. The answer, almost universally, was. “Hell No! I’m going to the West Coast Nationals their gonna have $10,000 in prize money! And much to my dismay, in one year the attendance at the USAF Museum dropped 60%, with all the stunt fliers heading west! So I guess that my personal excuse for not making it to the WCNSKC was that I was “kinda” busy in Dayton, trying to keep an event from dying! Sorry! Although my personal interest in competitions has never been about personal financial gain, I was VERY interested in an event that included money as a prize! One reason for the “interest” both mine and everyone else’s, in this Prize Money event revolved around Eric Streed! The Team, Top of the Line attended the 1987 East Coast Championships. And Eric took every opportunity to promote his West Coast nationals and the “perk” of prize money! Here’s Al’s “short story” about Eric Streed. Eric was one of the members of Top of the Line, so an excellent team flier. 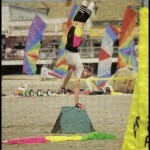 He was also one of the best individual flier at competitions.BUT Eric wasn’t very well liked by some people! Main reason was that, as mentioned, Eric was an exceptional competitor, he knew it, and never hesitated to remind you of it! Bragging is one thing, but Eric consistently back up his boasts, with results. And “high scores” tended to make other fliers “irritable” especially when Eric’s were “Higher” then theirs! Personally, I had a lot of respect for Eric! Out on the competition fields, I never came within 20 points of his high scores! Of course, this immediately convinced many fliers that they were going to attend the event and prove Eric wrong! I told Eric afterwards that his “Boast” was a great “promotional gimmick” to attract fliers to the event, he said, “What Boast?” Now that was the Eric Streed everyone knew, and loved!! The first WCNSKC and the offer of prize money did gain many attendees. The $10,000 was divided among the winners, with a percantage going to 1st, 2nd, and 3rd of all 5 events. Team winners recieved most, but I’m not sure of the percentages after that? (I searched high, and low and cannot locate flight orders, final scores, or money awarded. West Coast Gang! Help me out here?) BUT as the Midwest Competitors flowed back home, after the event, we all learned that money doesn’t ensure, smooth sailing. Quite the contrary prize money created a whole new set of problems never before confronted by SK event coordinators! One main problem was that the judges at the event were no longer, just volunteers, but people whose decisions involved money! There were record numbers of protests filed at that first event. So many, in fact, that for subsequent West Coast Nationals “Money” events if you wished to protest you had to “Pay a deposit,” of sorts, refundable only if your protest was upheld! sorts, refundable only if your protest was upheld! The fields used for the event were very small! I heard that 125 foot flying lines proved to be “Too Long” so, despite the field being “Prime” spectator territory, it also became a “Bone of Contention” with accompaning “Tons” protests! I even heard a story of some flier that borrowed money to buy a plane ticket to attend the event. Knowing “For Positive” that he would “Win” his money back! True?? I wouldn’t doubt it! The West Coast National Stunt Kite Championships with the offer of prize money was very successful. The “simple” voluntary job of Judge becomes “Monumental” when money makes it “serious” Sometimes, thinking back, I don’t think our hobby/sport was advanced enough in rules, procedures, and judging criteria and training to make West Coast Nationals a success, or easily judged! I really don’t think we are at that point even now. We have come a long way in official “rules” since 1987, but we have a long way to go yet! This entry was posted in Competition, General Topics, Kite Columns, KL Archive, Tangents and Trivia and tagged conference, Costello, Counts, Dolphin, innovative, Jones, League Style, Loera, Moore, Perron, prize money, Reich, Sedgwick. Virtual Freestyle 23 is underway!